The standard zipper foot is the foot of choice when it’s okay to have the stitching lines of the zipper showing from the outside of the garment, this is different from what the invisible version of this foot is used for. 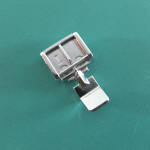 With the standard zipper presser foot, the zipper is stitched from the right side or outside of the fabric. The zipper is either basted or pinned to the garment, and stitching is done by stitching close to the zipper teeth. Some sewers may use basting tape to outline the location of the zipper after basting, topstitching along the outside of the tape to produce an even seam. Another feature of this foot is that the zipper may be sewn from either the right side or left side of the needle. The foot is actually attached to the sewing machine from the right side of left side of the foot. If the right side of the foot is attached to the sewing machine, then stitching of the zipper is started from the opposite side, the left side of the zipper. If the left side of the foot is attached to the sewing machine, then stitching starts on the right side of the zipper. For full instructions, with photos, check out our page on how to sew a zipper in a seam.